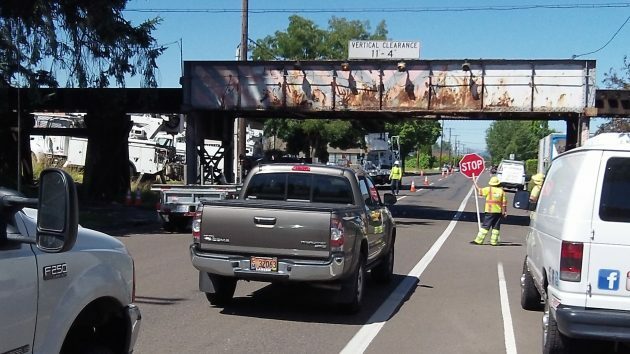 Traffic is flagged to a stop at the Lafayette Street railroad overpass on First Avenue Monday. At first glance, from afar, it looked like trouble with the Portland & Western trestle on First Avenue, where for decades trucks have now and then become stuck. But in this case, on Monday morning, trouble had done everybody a favor and stayed away. Instead, traffic was being flagged to go slow or stop briefly so that a utility crew could work on replacing a very tall power pole on the south side of the street just west of the bridge. As for trucks getting stuck, it wouldn’t happen if their drivers saw — or paid attention to — the detour posted for truck traffic. Or if they noticed the chains dangling overhead to warn drivers with their noise scraping over the roof. Or if they noticed the flashing lights on the bridge itself, not to mention the many rusting scars on the bridge from previous collisions. Or, the in the words of a man from ODOT standing by at the scene on Monday, if truck drivers did not rely on GPS systems that don’t show height restrictions on the routes they suggest. The drag chains should trip a circuit so that spike strips are auto deployed anytime one of these less than brilliant truck drivers tries to ram this historic bridge.